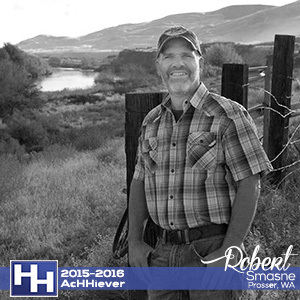 Heimer Hampshires has selected Robert O. Smasne of Prosser, Washington as the 2015-2016 AcHHeiver. Robert O. Smasne, a 4th generation farmer, was born and raised in the agriculturally diverse Yakima Valley in the Eastern portion of Washington State. His passion for raising showpigs started at an early age and can be credited to his dad, who has actively raised showpigs for the past 50 years. Smasne first started raising hogs as part of his 4-H project and then recently got back into the industry once his kids started showing.